Another day, another outfit I'm not sure about. This time the main problem is these jeans. I used to seriously love these jeans and I've only had them about a year (which is like 5 minutes in the jean world), but now I'm not really liking how they fit at all. Anyway, I can't find a picture of these shoes and I forgot to add the sunglasses photo. I'm a terrible blogger. But I am including a detail shot of my top. This is my 'kind of a miracle' shirt. I found it at a Goodwill in Nashville last year but it was covered in horrible stains. I thought it was half price and was going to buy it hoping that the stains came out. When I got to the register and realized it was full price, I put it back. Cause I'm that cheap. Then a few weeks later I found the exact same top (even the same size) in my own Goodwill...and guess what...no stains, for half the price! It's still one of my best (or luckiest) finds yet. By the way, I may have worn this on the blog before. I'm starting to have trouble remembering what I've worn and this is one of my go-to outfits, so you've probably at least seen something similar. There's still time to show off your luckiest thrifted finds at this week's Thursdays are for Thrifters Link Party ! 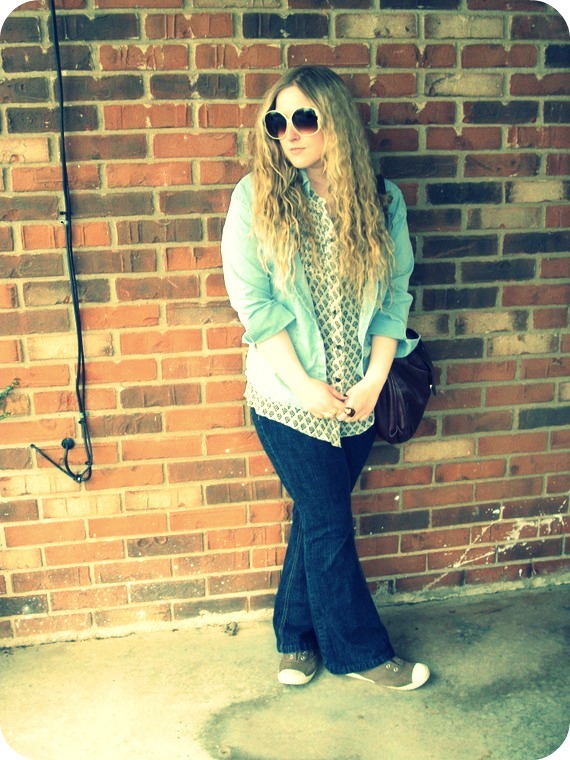 Jeans: Arizona, $15., Blouse: Thrifted, $2.50., Denim Shirt: Thrifted, $2.50., Sunglasses: Charlotte Russe, $5., Shoes: Old Navy, $4., Earrings: F21, 3 pairs for $1.50., Bow Ring: Charlotte Russe, $2., Copper Ring: F21, $3., Vintage Bag: Thrifted, $4. Miracle shirt! Meant to be! I don't see anything wrong with your jeans. Why don't you like them?